The Relevance of Vital Point Techniques. By Vince Morris 5th Dan. TERUYUKI OKAZAKI 8th Dan, Pioneer of Shotokan Karate-Do. Shotokan - A personal analysis. By George Moss 3rd Dan. Technical Analysis - A Formula. By Steve Hyland 4th Dan. Kata Course - The Kawasoe Way. By Gerry Stone 4th Dan. I.S.K.F. Master Camp U.S.A. Report By Doug Walsh 2nd Dan. Course Reports: Aidan Trimble (Wiltshire), Paul Mead (Blackburn). 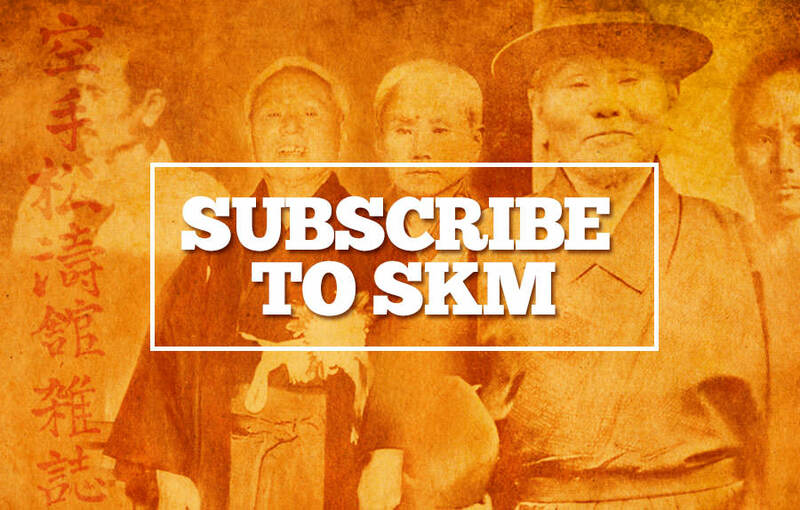 Choosing articles for S.K.M. is not quite as easy as it may seem, but judging by the tremendous response and popularity of the mag both here and abroad, we are getting it right every time. American Shotokan people love the mag and there are more 'Traditionalists' over there than you may think. If you read the l.S.K.F. report and some letters in this issue, you'll see the point. Talking about 'Points', Vince Morris 5th Dan of the F.S.K. 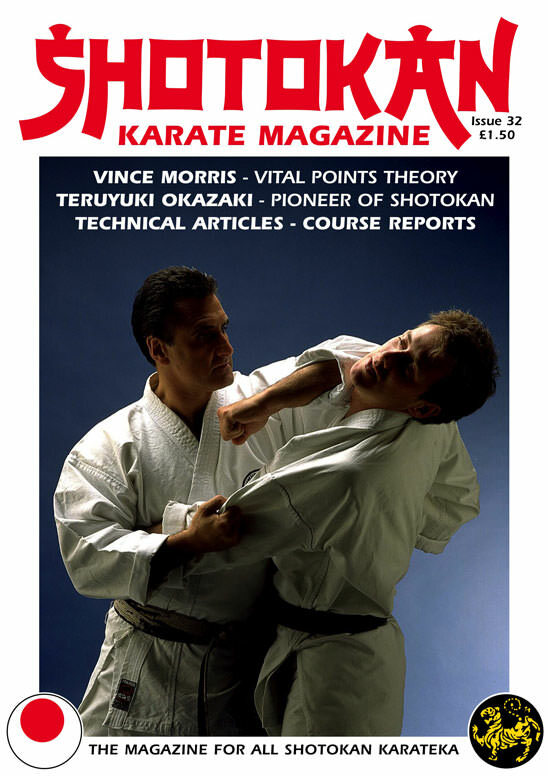 (Federation of Shotokan Karate) and a very senior British Shotokan Instructor, has written a great article about 'VITAL POINTS'. Vince, like his American counterpart George Dillman, believes that our KATA can be applied without change if the blocks and blows are aimed at Vital Points of the body. I know from very reliable people who have been to his seminars that Vince makes this work in no uncertain terms. I think you'll enjoy his theory. I think occasionally it's good to hear what the maybe not so famous SHOTOKAN karateka have to say about our style. In this issue George Moss, a 3rd Dan who has been training for nineteen years, week after week, year in year out and still learning and trying to improve, voices his views and opinions: thus giving another angle to the 'WAY' of SHOTOKAN. Continuing the very popular theme of the last few issues, I've purposely included a story on a historic figure from our style, the amazingly talented Master TERUYUKI OKAZAKI 8th Dan. One of the pioneers of spreading SHOTOKAN karate-do and resident in the U.S.A. for thirty years. I was given several articles a couple of years back by the l.S.K.F. 'SPOTLIGHT' Newsletter which appeared in earlier S.K.M. editions and once again I thank them for this marvellous story on a true Master and preserver of the Karate-do philosophy of our founder, GICHIN FUNAKOSHI. If ever any readers visit the U.S.A. and wish to train at any of Sensei Okazaki's dojos, please write to me at S.K.M. and I'll let you have the l.S.K.F. address. If you read Steve Hyland's article on 'Technical Analysis, The Formula', and you have ever practiced another physical activity, you will see a great similarity in the way movements are broken down into stages (sub-routines) and then built up from these parts into a 'whole'. In this way learning is progressive because the move has been 'thoroughly' understood technically, This method is often incorporated when learning any skill in any sport at all levels of ability. 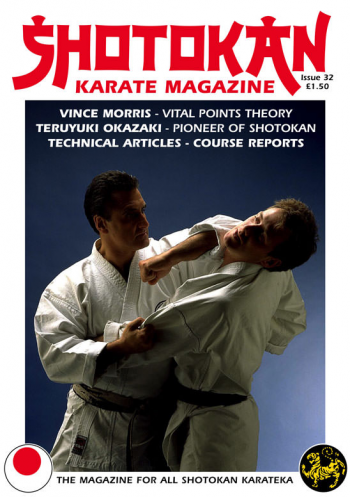 You will notice an advert in this issue for a company called SHOTOKAN U.K. I would like to mention that this company has no links or connections with S.K.M.